It’s the season for holiday parties, yummy holiday baking, big family dinners & more! It’s also cold & flu season. I’m sure all of us would rather be enjoying a holiday party instead of sitting at home sick in bed. Unfortunately, those nasty viruses can sneak up on you making you sick for special events you don’t want to miss out on. There are ways to prevent getting sick, like getting your flu shot, so you’re ready to pack for that exciting winter vacation you’ve been looking forward to all year. 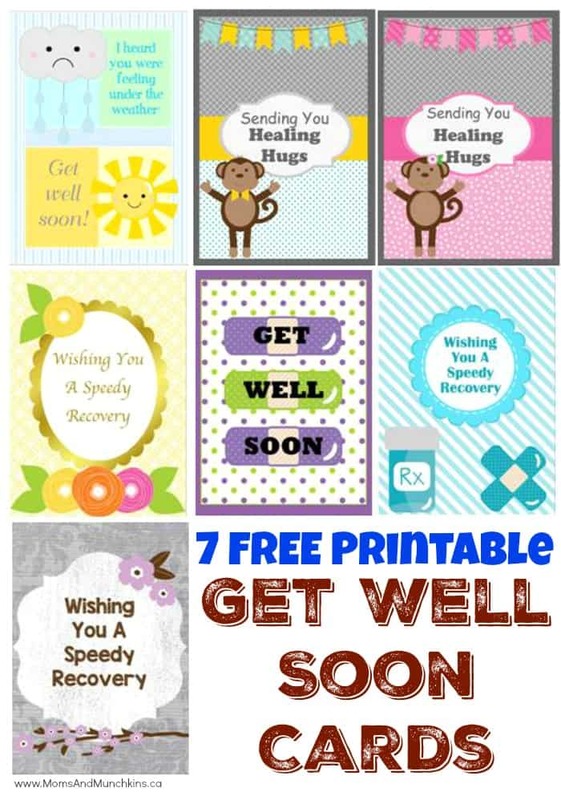 As cute as these free printable Get Well Soon cards are, let’s face it…you’d rather be handing them out than receiving them, right? No one wants to get sick so now is the time to start reducing your risk of catching the flu! My entire family caught a nasty virus two years ago that ended up sending both my husband & I to the hospital at the same time. It was horrible! I’m doing what I can to make sure that never happens again! Getting your flu shot: You can go to a Shoppers Drug Mart pharmacy to get your flu shot from an injection-certified pharmacist – no appointment required! Washing your hands & carrying hand sanitizer with you to use when you aren’t near a sink. Living a healthy lifestyle including eating healthy, immune boosting foods and exercising. Win a Cold & Flu Prize Package! THIS GIVEAWAY IS NOW CLOSED. The lucky winner is Natalie F.! *Disclosure: I was compensated for this post; however, all opinions expressed here are my own. Thank you to our designer Wendy’s Printable Party & Erin Bradley Designs for the adorable clipart. I have myself protected by getting the flu shot. When I take a shopping cart at the supermarket I wipe it with a disposable cloth. I try to stay away from sick people, wash my hands a lot & drink lots of fluids. For treating colds and flu I use Oil of Oregano. My doctor reccomended it after antibiotics seemed to be resisit and it worked! Handwashing is our most important defence! I get the flu shot every fall but also believe in washing germs away on the phone,controllers,etc with Chlorox wipes. I also think it’s very important to wash our hands a lot.